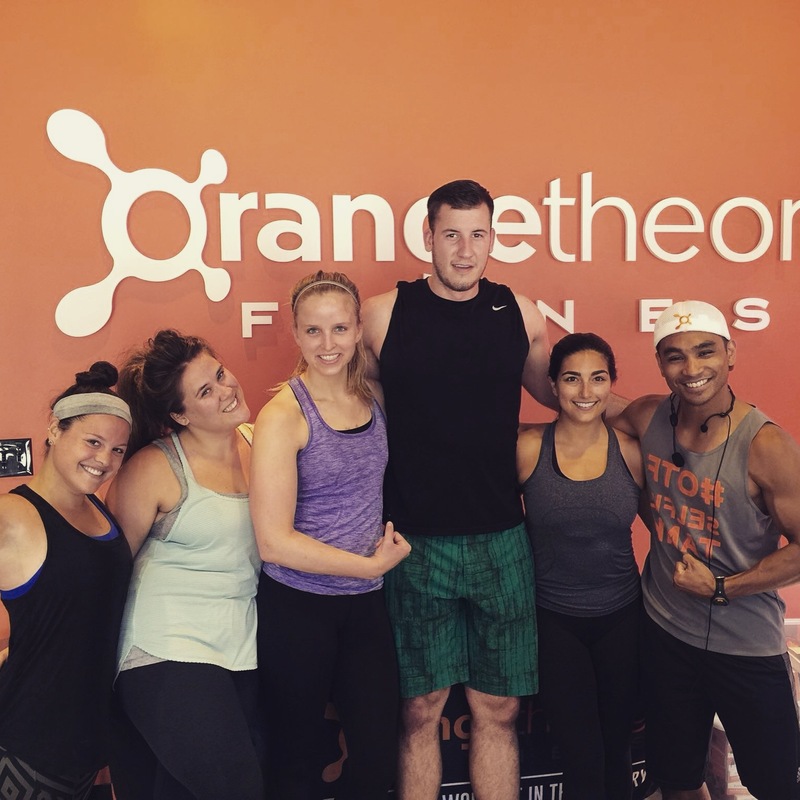 I recently had the pleasure of trying out a new studio in Chicago – Orangetheory Fitness. 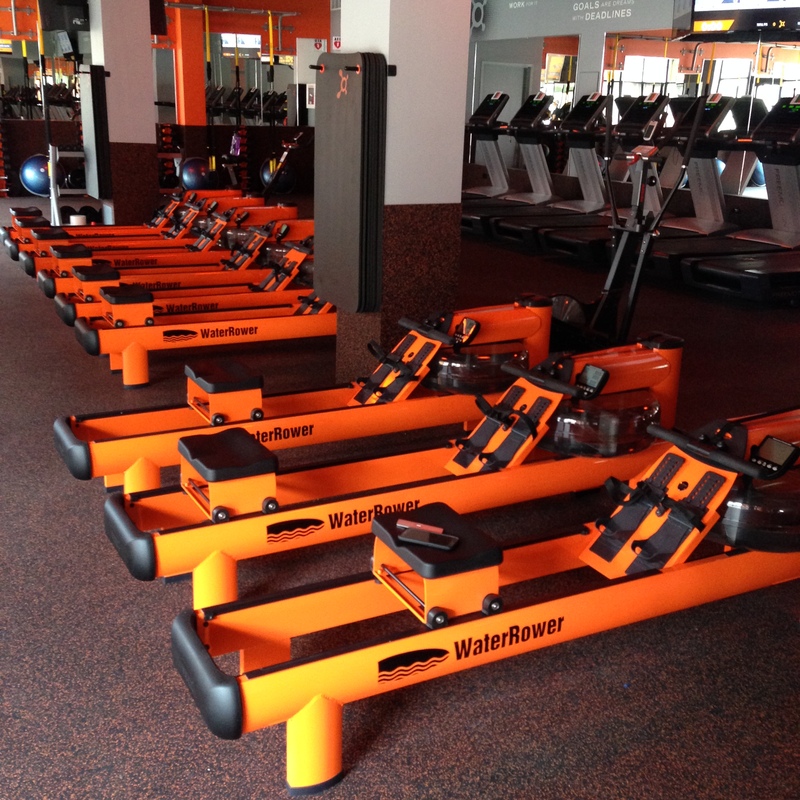 Now, Orangethoery isn’t a new workout – in fact, the phenomenon has been around for a few years already. But it’s quickly making its mark in my fair city so I was excited to give it a whirl. When they reached out about trying a class, I knew I wanted to right away. HIIT workouts are my jam, after all. So I happily jumped on the bus one Friday morning to check it out! I was pleasantly greeted by the staff as soon as I walked through the door. Steven, one of their ambassadors, signed me in promptly and then came out from behind the desk to sit with me and discuss my fitness goals. I have never had anyone do that with me before, even at my favorite studios. It was so personal and welcoming. My favorite part of the questionnaire was “One a scale from 1-10, 1 being you can’t walk up a flight of stairs without getting winded and 10 being you can run a half marathon, where would you say your fitness level is at?” I was amused by that question because I’ve made jokes that no matter my fitness level, I guarantee I will always get winded climbing a flight of stairs. I have no idea what’s wrong with me. So I played it safe and said 6 – didn’t want to head in there too confident, seeing as I had no clue what was in store for me. 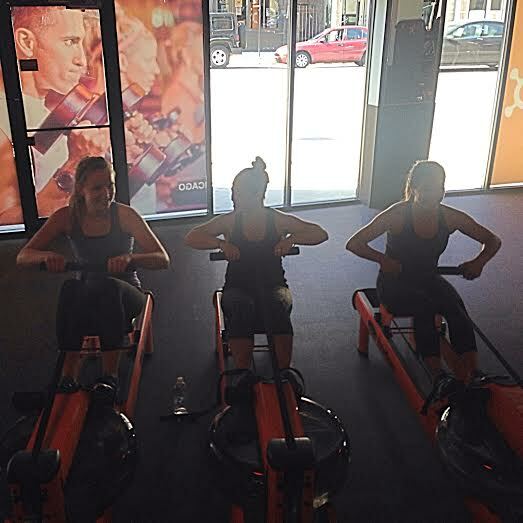 The good people at Orangetheory recommend arriving 30 minutes early before your first session, and with good reason. After the questionnaire, I met Ryan, my instructor for the day, and he led me into the studio to take a look at and explain the equipment to me. We worked through how to properly wear my heart rate monitor, how to use the water rower, what the different “zones” mean on the treadmill, and what the strength portion would look like. Pretty soon the rest of the class began filtering in and we were off. Since it was a smaller-sized group, we all started on the rowers. Usually the class is divided in half, with half the class starting with a treadmill series and the rest doing rowers/strength. First we did a quick warm-up on the rowers (thank goodness Ryan had corrected my form earlier because I wouldn’t have known how to fluidly move on the rower without his instruction). After the rowers we hit the floor for a TRX and free weights strength series. I very much appreciated that the room was full of TVs with someone simulating each exercise. I tend to zone out when I’m working out, so it’s always tough for me to remember exactly what I’m supposed to be doing and for how long. At other studios I always find myself looking at the board over and over again trying to refresh my memory, which probably wastes a decent amount of time, so I loved this about Orangetheory Fitness. 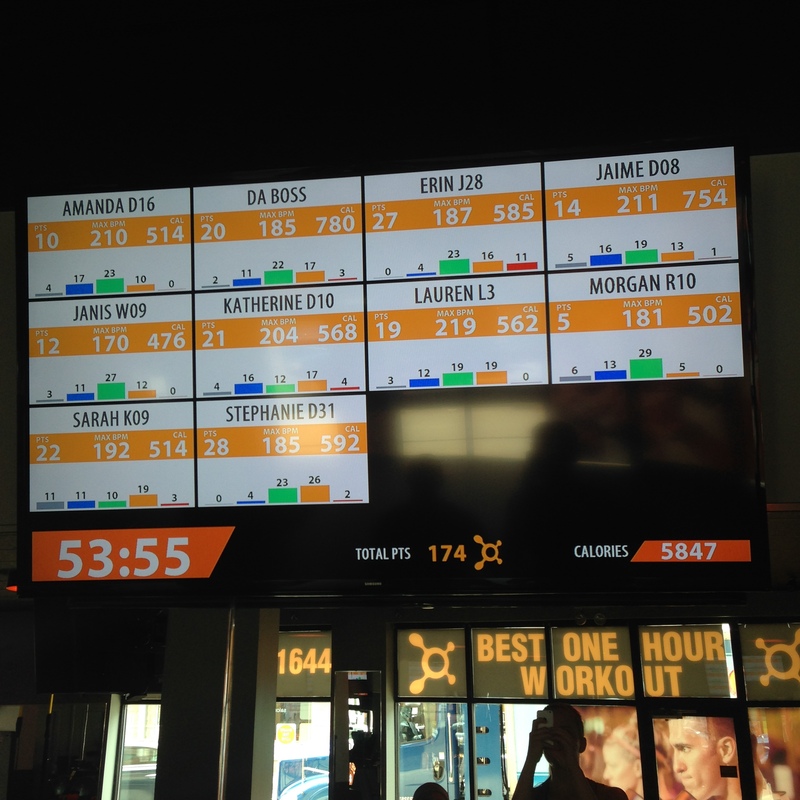 We had six movements total, and the combinations made for a great overall workout. At the very end we did some core work (my nemesis) and even though I hated every minute of it, it definitely felt like the cherry on top of a very balanced fitness sundae. The second part of class consisted of 25 minutes on the treadmill. We started out at a “base pace” (mine was 6.0 aka 10 min miles) and then consistently did bursts of higher speeds throughout the time, all while on a 1.0 incline. At one point I was sprinting at 10.0 feeling like the roadrunner. At the end of class I found out that the man on the treadmill next to me was John, the owner of the Wicker Park location (no pressure at all). We had a great talk about what makes Orangetheory special, and between that conversation, Steven at the front desk, and the instructors, I could definitely grasp that “family feel” that he was touting. After my first two visits, my only gripe is that I had an issue with my heart rate monitor getting a continuous read. They recommend spraying it with a bit of water before you hook the monitor around your breast bone, and I most likely did it wrong. So besides the fact that the HR monitor just wasn’t having it, I’ll live. I’m fine working out without a heart rate monitor, but if I AM going to wear one, I want it to be accurate. After all, it is a noticeable piece of equipment tightened around my body and not exactly the most comfortable. I also wasn’t totally sure how to get into the right “zones” and what exactly I should end with (in terms of that colorful bar graph on the TV), but I know that is something that comes with going to the classes more frequently. My favorite part of the class? It was manageable. No, it wasn’t easy. But it was something I feel like I could do almost every day. I am lucky that I work for a company that pays for me to work out, but if I didn’t, I would be skeptical to invest my money in a single membership anywhere, especially at places that I didn’t feel like I could really commit to. But this was one of the most balanced workouts I have experienced in awhile and I will definitely be back. Cardio + strength combinations is where it’s at. 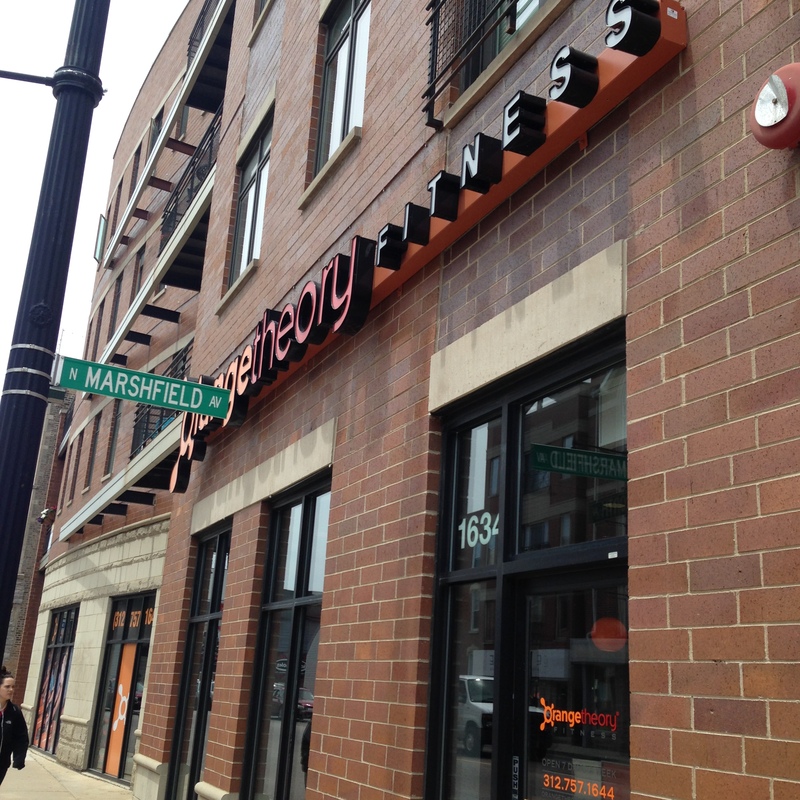 Orangetheory Fitness has multiple locations in Chicago, but I’ve only ever experienced the Wicker Park location. So if you want any more info about that particular studio, reach out to me and I’ll give you Steven’s number – we’re on a texting level now NBD. I’m always wary when prices aren’t directly listed on a site. I honestly think the prices of Chicago studios scare about 75% of people away which is why they encourage you to try the first class for free, talk it over with the staff and trainers, and figure out if it’s right for you. Bottom line, first class is free. Try it — no risk — and see if you get hooked. And as always, if ANYONE is nervous about trying a new studio alone, please shoot me an email and I’d be more than happy to attend with you. 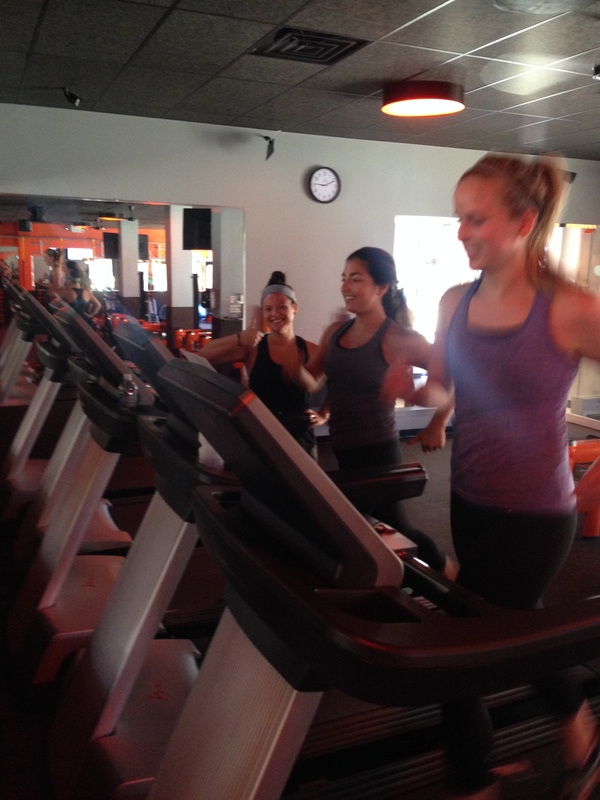 Orangetheory Fitness: yay, nay, or eh? Favorite workout song now that gets you pumped up — go! I’ve been meaning to get over to my local OTF studio and give the class a try. I really am trying to keep strength training in my weekly routine, so I think this would be able to give me a cardio fix while fulfilling my strength requirement haha. Great review – thanks for sharing!! It’s nice when you can get both done at the same time for sure! I didn’t realize there were so many Orangetheory locations in the city! I’m impressed with how much personalized attention they gave you. I feel like I got a pretty decent handle on the studio scene in Chicago when I did a month of ClassPass (I went to 20 different studios in that time), and I definitely never had anyone ask me those sorts of questions, demo how to use equipment that throughly, etc. Sounds awesome! This sounds like a great workout! There are a few in Maryland but nothing close to me (yet). Hoping to try it at some point! Maryland needs to step up its game!! Orange Theory is my jam right now! I go twice a week and absolutely love it. I’ve noticed that it’s really helping me improve on my running times and strength, so no complaints here. Yeah I just saw your post! I’m glad I’m not the only one who’s hooked! I’m not gonna lie… running is my first and only love. But that doesn’t mean that it’s for everyone, 100% of the time the way it is for yours truly. But this orange thing certainly sounds fascinating. I love how the machines are all orange. That just speaks to my artsy little self. I’d definitely be down to try this out. You know I love me some HIIT. I walk by the one in Old Town sometimes and it looks pretty sweet! We are getting an Orangetheory right across from my Pure Barre studio. I’m so excited to check it out, because I’ve heard all really great things. How exciting! Yeah it’s definitely something to try — the workout flies by because you keep switching it up. Wonderful! Thank you so much for the advice and commenting 🙂 I loved the workout and will definitely be back! Flywheel is great too! Anything with loud, fun music is my jam! looks like an amazing studio! This sounds awesome! I’ll need to stalk the locations and look for something close 🙂 I have a love/hate relationship with rowing though… That stuff’s HARD. It’s funny — it seems like it would be easy but after about a minute it’s tough stuff! I might try Orangetheory if it was free or really discounted. I like my running and podcasts too much 🙂 The song that gets me pumped up in “Heartbreak Song” by Kelly Clarkson. Gotta love some girl power! If anything just try it once for free! Shake it up 🙂 I know a lot of people are loving that song right now! 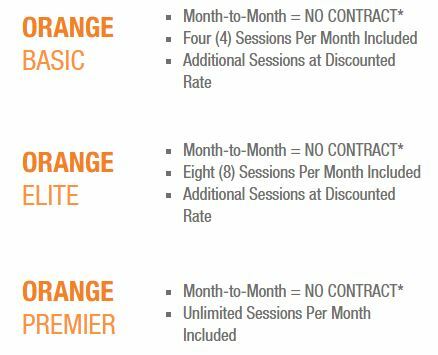 I’d actually never heard of Orangetheory before you post but it sounds like an awesome experience! I like the idea of having TVs spread out that show the different moves because I’m the same way with zoning out during exercise, so the less thinking/remembering I have to do, the better. That looks like it would be a killer workout, but in a good way. If there is a good way to have a killer workout haha. I wish we had more stuff like this in the UK. So many bloggers have been trying Orangetheory! We don’t have one in town, but I’d love to try it! I guess you’ll have to make your next trip somewhere with an Orangetheory so you can try it out 🙂 might I suggest the Windy City?? Great review! Such good detail. 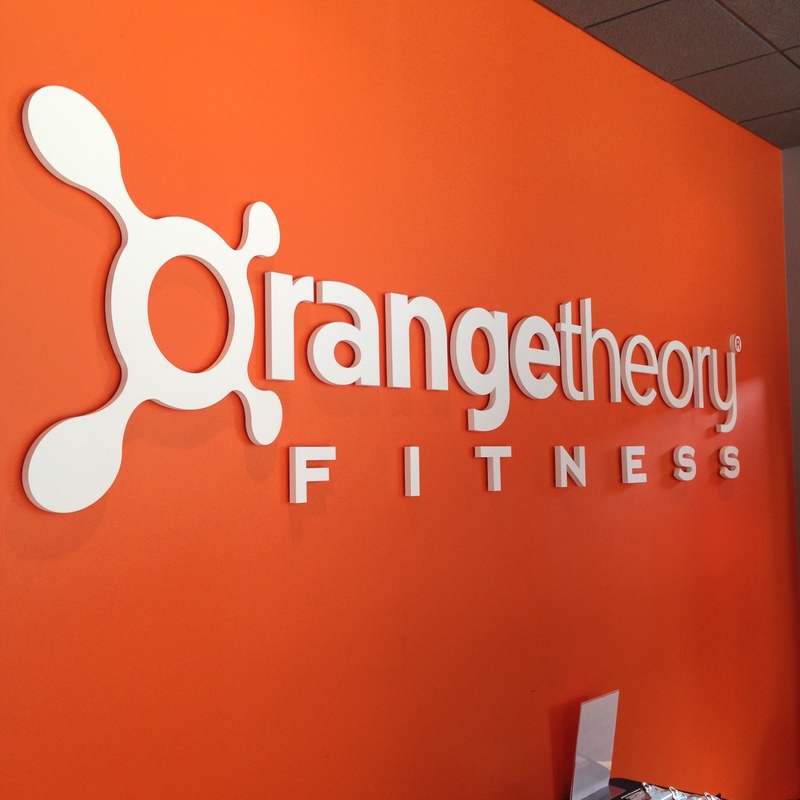 We have an Orangetheory near our apartment. I am curious to check it out on of these days. Thanks for the info! Definitely give it a shot! I’d love to hear your thoughts on it, since you’re such a fitness badass and all. They are totally popping up everywhere! I saw one by my hair cut place and was really interested in what it was. They really are popping up everywhere! 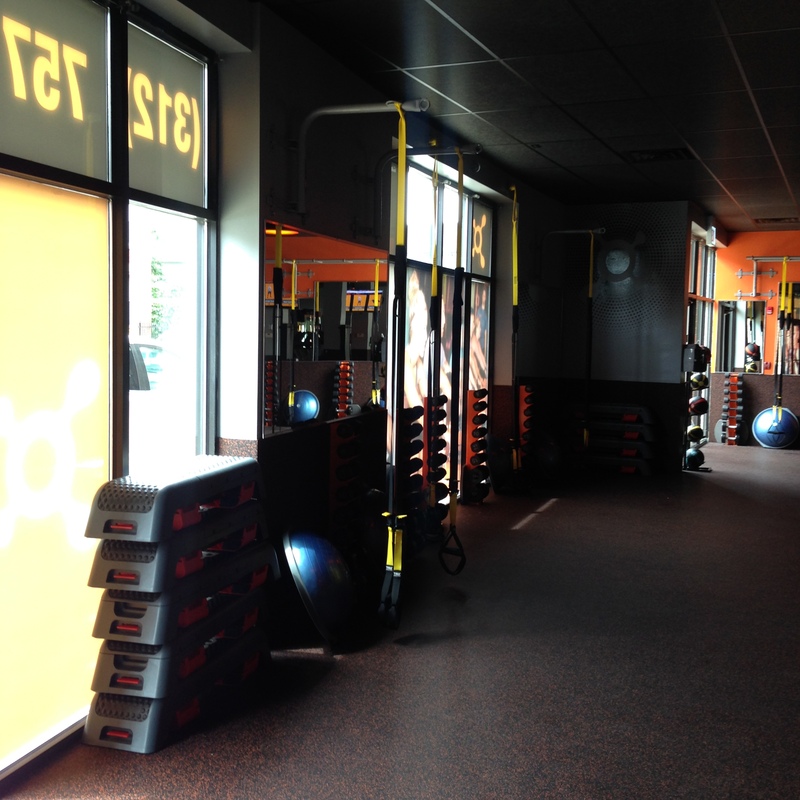 I’ve seen so much about Orangetheory Fitness recently that I wish I had tried it out while we were in Houston! I’m sure there’s one relatively close to us now, I should look into it. I’ll have to look into that! I need some new jams! It’s catching on in CA too! I keep saying I need to check it out. My little sis goes in GA and LOVES it! Definitely give it a shot! I really enjoyed it! Thanks for this review!! I’m moving to Chicago in August (Bucktown actually!) so I was planning on giving this studio a try so it was great to find this. Do you recommend any other places in the area over OTF? I figured I’d give a couple a try before fully committing. Awesome! You’ll love this city it’s a fitness-lover’s dream! The only other two spots I’ve tried in Bucktown are Bucktown Crossfit and CorePower Yoga, both of which I love. Those three are so different though! Haha. I highly doubt Orangetheory Fitness studios have made it to Kuwait yet (boo), but this definitely has me wanting to look around & see if I’m wrong (fingers crossed!). Haha probably not 😉 maybe one day! I can definitely see not loving the running part if that’s not your jam haha it’s tough! Orangetheory sounds like so much fun!!!! I need to find out if they have it in Sydney. That is so funny about the stairs question- I was walking up this really steep hill near my house the other day and completely puffed and wondering what that was about haha. We can run miles and miles but apparently stairs and hills are different! Sounds awesome! I need to find one of these near Boston! How fun! Hopefully they make their way to Austin! Fingers crossed! I can definitely see it in Austin!